PET is more than a foundation on which to build a hybrid technology. In its basic form, it continues to provide excellent spatial and temporal resolution for clinicians in cardiology, neurology, and oncology. Once deemed expensive, now PET is often considered a cost-effective option in the molecular imaging realm. But versatility is a main descriptor. PET remains fertile ground for a hybridized seed that can flourish into new modalities. Consider PET/MRI. That kind of trade-off existed with early PET scanners for cardiac imaging; Positron went the opposite way, eschewing the trade-off for a system targeted at cardiac imaging. “We perceived a need for a dedicated scanner that imaged the way a cardiologist wants and that provided other substantial benefits,” Oliverio says. Its product—which went into development in 2006 and was FDA approved in 2009—is designed to provide high-system uptime, reduced radiation exposure, and proprietary cardiac-specific software. In 2010, the device received Frost & Sullivan’s North American Molecular Imaging System New Product Innovation Award. The Attrius footprint is small enough to fit into a 15- X 20-ft area and costs less compared with PET/CT. Considering the initial price, installation costs, and ongoing maintenance, a PET/CT purchase can be a hard sell for private cardiology practices, Oliverio says. While a PET procedure is more costly than a SPECT exam, a PET deployment in cardiac nuclear medicine can reduce long-term costs, according to the company. Positron says the system is designed with fewer boards, easier access to detector modules, automated turning features built into the gantry, and coronary artery overlay display. A large list mode buffer enables concurrent acquisition of flow, perfusion, and function in a single scan. The integrated INTEL chipset provides cardiologists quick assessment with reconstruction times of ungated images in less than 7 seconds, Oliverio says. Further, Attrius enables rapid, dependable studies for larger patients, featuring a 450-lb table capacity. The table can be raised or lowered for easy, comfortable patient loading. The open architecture fosters new protocol development and customization. While Positron focuses on cardiology, GE Healthcare’s new PET technology products focus on oncology. During RSNA 2011, the company introduced Q.Suite, a tool set designed to enhance PET for cancer treatment. Such issues drove development of Q.Suite’s set of hardware and software tools designed to reduce variability and, in turn, increase accuracy, repeatability, and quantitation. “Motion is a huge factor in variability,” Bhatt says. “If not taken into account, the physician can underpredict by as much as 40%.” That’s a huge amount, when looking at accuracy. The suite’s unapproved Q.Freeze technology combines quantitative benefits of 4D phase-matched PET/CT imaging into a single static image, eliminating motion. Q.Freeze is awaiting 510(k) approval and not yet available in the United States. • Q.Static adds basic motion correction techniques that automatically isolate data when organs are in low-motion state. The resulting single-image series reduces blur from organ motion. • Q.Check creates a link between the console and the workstation that ensures patient and exam information necessary for quantitative imaging is saved in the patient file before the exam is finished. • Q.Core enables PET acquisition and reconstruction processing to occur much more quickly. • PET VCAR allows access to quantitative information, managing multiple lesions and multiple patient exams over time. Massachusetts-based Photo Diagnostic Systems focuses PET/CT into the realm of neurologic imaging. It is developing NeuroPET/CT, a small field-of-view, portable scanner designed to provide PET/CT images of the brain, serving a growing, emerging need: the aging US population. The device has not yet received premarket approval from the FDA. The autumn of the baby boom generation brings with it neurodegenerative illness, including Alzheimer’s disease, mild cognitive impairment, frontal-temporal dementia, and Parkinson’s disease. This increases the need for PET technology. “It’s difficult to make a definitive diagnosis for something like Alzheimer’s,” says Olof Johnson, president, chief engineer, and cofounder of Photo Diagnostic Systems. The problem is that the current gold standard for diagnosing Alzheimer’s is silver straining on the brain, which is detected at autopsy. New PET agents may change that. “A PET scan is becoming increasingly accepted as an effective diagnostic technique, and this comes in conjunction with newly available tracers,” Johnson says. Photo Diagnostic Systems would like to fill that niche when it develops. Further, it’s air cooled. “Water cooling isn’t required, which means it can be used in a variety of locations,” Johnson says. For instance, it could serve long-term care facilities and hard-to-move patients. “It can be deployed in the ICU, a surgical suite, mobile truck installations, or an office, and it can measure response to dosimetry in proton therapy, which frees the patient and the clinician from the accelerator,” Johnson explains. • dose-reduction technology for patient and user. Siemens’ renewed Biograph mCT PET/CT scanner, which was cleared by the FDA in February, offers accurate, reproducible quantification in molecular imaging and assists clinicians in their treatment decisions for neurological, oncologic, and cardiologic conditions. Highlighted at RSNA 2011, the system allows for the precise measurement of metabolic processes and data quantification, including the assessment of neurological disease, growth of cancerous tissue, and perfusion, according to the company. “We looked at existing features—hardware, software, and some of the more engineered components, such as the bed—and made improvements that enabled far better accuracy and allowed us to be far more quantitative as far as the image created,” Brait explains. Accuracy, reproducibility, and quantification help physicians precisely characterize cancerous lesions, which leads to better staging and monitoring of metabolic changes and activity and, in turn, more accurate assessment and better treatment. The new Biograph mCT also integrates Siemens’ OptisoHD (High-Definition) Detector System, which features a volumetric resolution of 87 mm3, and Time of Flight (TOF) and HD-PET. This integration results in rapidly acquired, precise images with greatly reduced radiation dose. With Quanti-QC, system normalization is accomplished overnight and leads to precise calibration and tuning of the system to specifications. “Essentially, it is quality assurance that assesses and corrects scanner performance, keeping the system running at its peak,” Brait says. The system also features Auto Cardiac Registration that automatically aligns CT and PET heart images and reduces variability between users. Also, advanced syngo clinical applications provide the means to obtain quantifiable measurements in neurology, cardiology, and oncology imaging. SUVpeak, new in the syngo.via oncology engine, provides consistent, reproducible quantitative assessments of hot spots. Myocardial blood flow can be used as an absolute quantification method to assess balanced disease in all areas of the heart. Additionally, the syngo.PET Neuro DB Comparison application, a new quantitative tool in neurology, automatically registers brain data to a FDG-PET normal database to aid in the assessment of neurological disorders, according to Siemens. 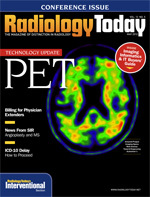 Customers are placing orders for the new Biograph mCT PET/CT, with the company expecting to ship in late spring/early summer 2012, Brait says. As PET/CT has demonstrated, PET lends itself well to hybridization, and there’s an emerging market for PET/MR. These scanners combine functional imaging data and anatomical imaging, bringing MRI’s excellent soft tissue characterization and imaging without ionizing radiation. Siemens’ Biograph mMR PET/MR system was approved in June 2011. In November 2011, Philips reported FDA clearance for its whole-body PET-MR system, the Ingenuity TF PET/MR. Spotlighting the system at RSNA 2011, the company believes this will further personalize treatment for oncology, cardiology, and neurology. GE Healthcare is researching the development of an integrated PET-MR system capable of TOF and MR spectroscopy.